Background: Self Interacting Proteins (SIPs) play an essential role in various aspects of the structural and functional organization of the cell. Objective: In the study, we presented a novelty sequence-based computational approach for predicting Self-interacting proteins using Weighed-Extreme Learning Machine (WELM) model combined with an Autocorrelation (AC) descriptor protein feature representation. 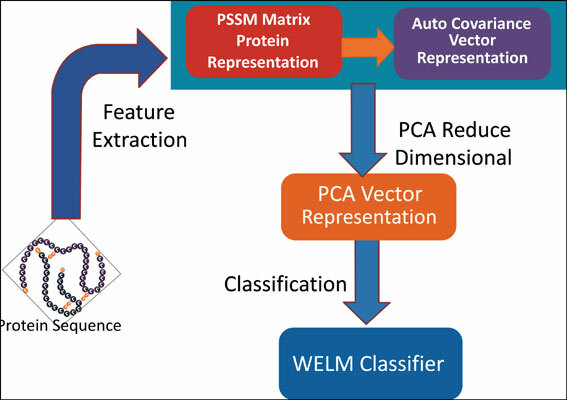 Method: The major advantage of the proposed method mainly lies in adopting an effective feature extraction method to represent candidate self-interacting proteins by using the evolutionary information embedded in PSI-BLAST-constructed Position Specific Scoring Matrix (PSSM); and then employing a reliable and effective WELM classifier to perform classify. Result: In order to evaluate the performance, the proposed approach is applied to yeast and human SIP datasets. The experimental results show that our method obtained 93.43% and 98.15% prediction accuracies on yeast and human dataset, respectively. Extensive experiments are carried out to compare our approach with the SVM classifier and existing sequence-based method on yeast and human dataset. Experimental results show that the performance of our method is better than several other state-of-theart methods. Conclusion: It is demonstrated that the proposed method is suitable for SIPs detection and can execute incredibly well for identifying Sips. In order to facilitate extensive studies for future proteomics research, we developed a freely available web server called WELM-AC-SIPs in Hypertext Preprocessor (PHP) for predicting SIPs. The web server including source code and the datasets are available at http://219.219.62.123:8888/WELMAC/. SIPs, weighed-extreme learning machine, PSSM, Autocorrelation (AC) descriptor, PCA, protein sequence.